Actually I’ve finished this top sometime ago before we moved to this house, but haven’t got time to take proper pictures. I’m still looking for a nice spot for taking pictures, I kinda miss the blank wall in my old apartment. 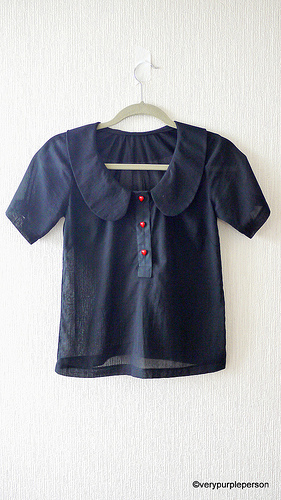 I think it is quite a cute little top, the shape is simple enough to be made in different fabrics for wardrobe addition. 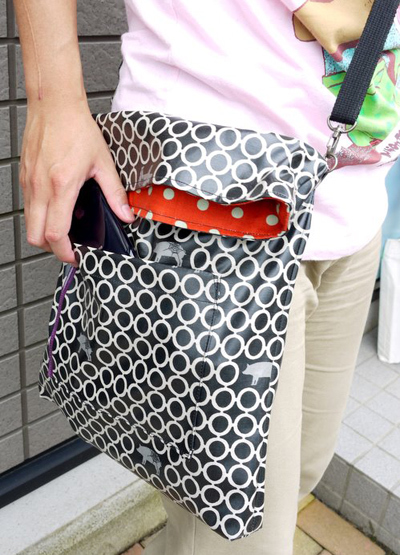 I’m planning to make another in print fabric for summer. 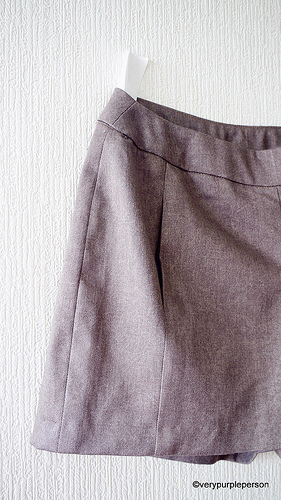 The shorts were made with Iris shorts pattern by Colette, it is one of their newly-released patterns for spring. I was pretty excited when Colette released these patterns, especially because they are now available in digital forms. 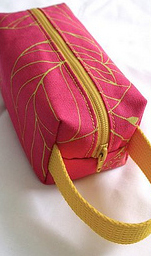 It means that I don’t have to wait several weeks for shipping, I can sew it rightaway! 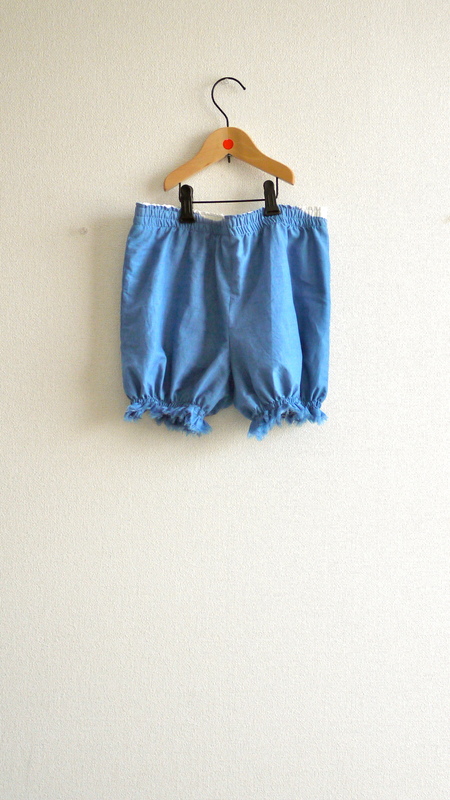 Anyway, it turned out that I didn’t sew the shorts just until yesterday…. 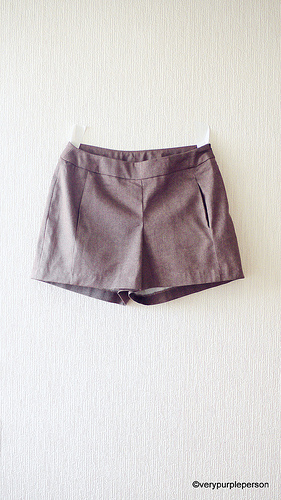 Pattern description: “These simple and cute shorts are so quick to sew, you could make them in every color. 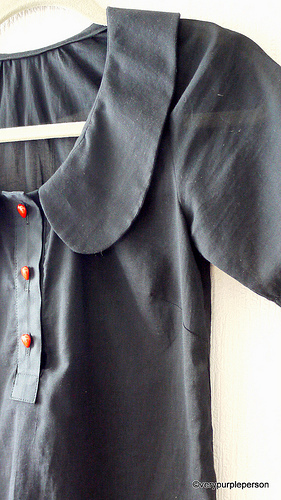 Pockets are set into a front side seam and optionally close with buttons. The shorts sport a 4 1/2 inch inseam length and close with an invisible side zipper..” I made them in size 2 with no alteration. Usually I’m a size 0 in Colette patterns, but the finished size measurements showed that there is only 1/2 inches ease around the waist. I thought that this is too little to be comfortable so I chose size 2. As usual for all Colette patterns, the instructions are very clear and constructions went quickly. It fits perfectly well around my waist and not too big around my hip, although it is size 2. The crotch is quite close-fitting, and I think it makes the back area looks better than the usually low-crotch RTW pants. However, there is a lot of lines around the center front, also there’s a bit of diagonal lines in the back side. Maybe I should have made some fitting alterations to the pants, but I have no idea what kind of alteration that I need to eliminate these lines. Anyway, the fabric is a meter of twill that I found in my stash, and I have completely forgotten where I got it from. I think it is linen/cotton mix and it is very comfortable against the skin, perfect for summer. Top pattern is Banksia by Megan Nielsen, size XS. Shorts pattern is Iris by Colette patterns, size 2.